Before dams, the widest spot on the Mississippi River was just over two miles, Lake Pepin in Minnesota, but anywhere you cross the river from Minneapolis down, it’s impressive. It’s a huge tongue of water, brown and thick, slicing through the landscape, flowing under bridges five stories high, moving earth, barges, and whole trees toward the Gulf. People stop and stare. They write songs and name states after it. They understand the Mississippi. The Everglades is fifty miles wide and you can stand in the middle of it and wonder where the river is. No one even believed it was anything but a stagnant swamp until the mid 1900s. It drains the center of Florida from Disney’s theme parks to the southern tip of the peninsula, hiding in grasses and marshland, sinking past hardwood hammocks and mangrove islands, flowing like a water spilled across a limestone table. It doesn’t look like a river–it looks like grass and mud and trees on the horizon–but it flows down that tilting table to Florida Bay with all the sins of a state in its grasp. Developers cut pieces away, drained chunks and filled in lots. They dug canals and bulldozed trees. They sliced, gnawed, and tore away half the Everglades, turning it into suburbs and strip malls. They even tried to build the biggest airport in the world there once, right in the middle of the river–six runways for supersonic jets, Concords racing across the sky, a new commercial center in the heart of South Florida–but they only managed one strip of pavement. And for the last forty years, Floridian’s, the National Park Service, and environmentalists have pushed back to save what’s left of one of the most complex ecosystems in the world. Negotiations for water rights between big cities and environmental groups, land acquisitions and waste-water treatment procedures, a multiple decade effort to raise a road blocking the water flow, all of it trying to hold onto the wild heart of the state, to keep it from flat lining and slipping off the edge, to save a place where panthers are not a memory, where alligators and crocodiles slide off mud banks, and John Buckley and I can spill into Florida Bay on water from as far as Orlando feeling free and alive and lucky that the Everglades still exist. A piece anyway, growing or shrinking with our collective decisions. 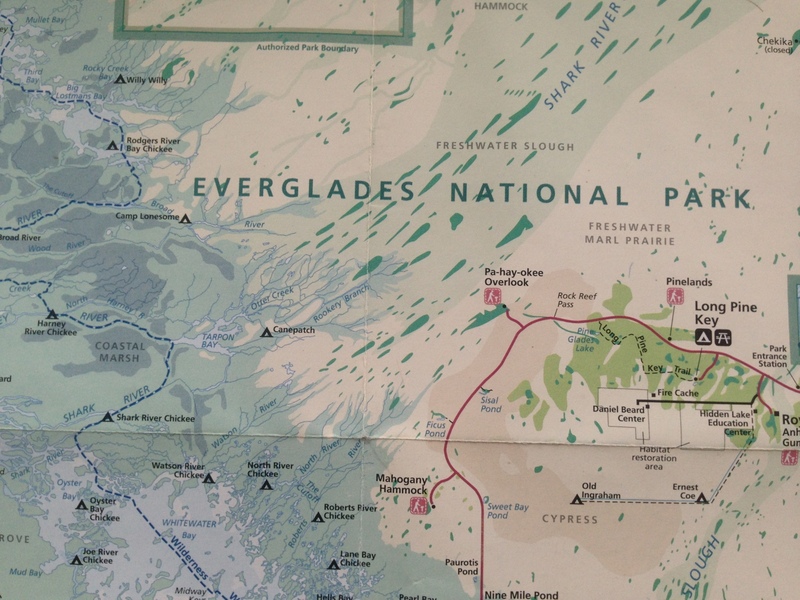 The process to protect the Everglades is ongoing. Just this month, a new mile long bridge will replace a section of the Tamiami Trail, the first piece of an ongoing effort to raise the road and allow water to flow through the Everglades again. The Everglades are a key part of any effort to protect Florida’s Wildlife. Hundreds of animals rely on the ecosystem to survive. Without it, everything from migratory birds to the Florida Crocodile could disappear. The Florida Wildlife Federation works every day to help protect these environments. Please visit their webpage, follow them on Facebook and Twitter, and learn how you can help wither through donations or calling representatives to promote legislation that recognizes how important protecting Florida’s environment is to our future. Posted in Angle to Key WestTagged Angle to Key West, development, environmental protection, florida wildlife federation, river of grass, the evergladesBookmark the permalink. What a beautiful description of the Everglades!